We can't help you with all your responsibilities but I have the perfect dinner solution, especially for those crazy, busy days – Crock-Pot dinners! There is nothing better than coming home to a meal that is completely cooked and ready to eat. This sure beats stopping for unhealthy fast food and the Crock-Pot dinner can be much more economical. We love saving money! Having dinner ready after a busy day… isn't that every cook's dream? Another plus with Crock-Pot dinners is it's a one pot meal and clean up is a snap! Some people use a Crock-Pot liner to keep the pot clean. Others just let the pot soak in hot soapy water while they relax and enjoy their dinner. I asked a mother who has 8 children how she managed to pull off dinner hour? She said "Being together as a family is so important to us that our family decided we all needed to cut back on individual activities." She mentioned that because she has teenagers. "It is often impossible to have everyone home for dinner at the same time. The kids that are not at the dinner table during dinner time know that other family members are having dinner together and that gives them some feelings of structure. When they return home from activities they know a plate of something homemade is waiting for them." A Crock-Pot dinner could be the answer. Teenagers can certainly be helpful as you teach them how to cook using a Crock-Pot. If you put them in charge of dinner one night a week, give them the ingredients and instructions. They can fix it and forget it! This gives them time to do their activities and still have dinner ready when everyone gathers. This is a great way to prepare them for going off to college or living on their own, when they will still be busy but need to continue to eat healthy. Now that fall is in the air, soon to be followed by winter, it's time for warm, nutritious meals. A Crock-Pot can cook anything from hearty stews, chili's and soups. 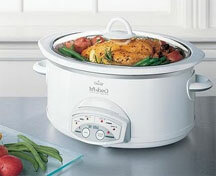 Slow cooking also makes tender meats and vegetables as well as warm cobblers or other delicious desserts. You just have to find recipes your family will enjoy. Here are some good ones to try. Spray crock pot with cooking spray. Add chicken and sprinkle with taco seasoning. Add all other ingredients and cook for 8 hours. Serve over brown rice. Cut meat into desired pieces. Mix in a shallow dish the flour, mustard and salt. Coat pieces of meat with flour mixture. In a hot skillet, heat the oil and add meat. Brown the outside of the meat on both sides. This takes about 10 minutes. Place all other ingredients, including the meat, into the crock pot and cook for 8 hours on low setting. If the beef isn't tender enough, cook it a little longer. Combine all ingredients in Crock-Pot, except noodles. Cook on low heat for 8 hours. Stir in noodles and cook for 10 more minutes. Even on the busiest days, you can enjoy a hot, homemade meal, compliments of your Crock-Pot. Well, there were more than this, but this is what some of them came up with. It's a wonderful reminder to me why we should create our own cookbook. I've also learned not be afraid to try something new once in awhile. My brain might be saying "Oh no!" But, my mouth might just say "Oh yes!" It might even become a "Family Favorite". For more delicious crockpot recipes you can check out the Cook'n Fix & Forget cookbook.